Fagan Silber’s reply is cut off in the image at that point, so I don’t know what else she had to say. Can you imagine if political and social conservatives made such public comments about the mass injuries and deaths of people they presumed to be liberals? Can you imagine the moral outrage? Only a totally insensitive buffoon would say something like this, regardless of politics or biases. Why did Geftman-Gold and Fagan Silber think it was perfectly acceptable to make such statements, to all but enjoy the victimization of those shot in Las Vegas? It isn’t acceptable when anyone is gunned down in cold blood, I don’t care who it is. Yes, we all especially feel wounded when children die, whether by gunfire or any other reason, but that doesn’t make it right to think people deserved to die because 1. They enjoy country and western music, 2. because they are presumed to be Republicans, and 3. because of the first fact and the second presumption, they are also assumed to have no concern about people who have died by gun violence. 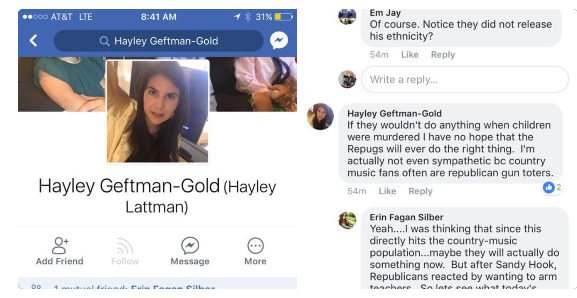 Ms. Geftman-Gold lost her job in short order as a result of her online behavior, but it’s startling to consider that she felt perfectly free to make such statements as if they would be accepted by everyone, including her (former) employer. The irony for me here is that I don’t doubt for a second that Geftman-Gold sees herself as a good and moral person. She apparently cares that children were shot and killed at Sandy Hook. As a political and social conservative, so do I, and I’ve prayed, grieved, and memorialized over those poor children and their families. So I do not believe Geftman-Gold and Fagan Silber hold the corner market on compassion and morality. After reading their comments, in fact, I believe quite the opposite. Here is a bit more information about a seemingly ordinary citizen who is capable of expressing such terrible thoughts. Regardless of how we disagree with each other the rest of the time, shouldn’t we come together as human beings in the face of such tragedies? What the heck is wrong with people? Some ding-dong says something inexplicable and she gets fired. Do we have to pretend, now, that she didn’t get fired? And who the heck are we supposed to imagine thinks she “holds the corner market” on ANYTHING? Marleen, while I freely admit there are more than a few conservatives who think they are morally correct because of their social and political beliefs, it does seem that the door swings both ways. I hope that the vast majority of conservatives, moderates, and liberals uniformly condemn all acts of terrorist, regardless of who commits them and regardless of who the victims are, but it’s stunning that an educated person working for a major communications network as a Vice President felt no (apparent) hesitation at expressing “no sympathy” for 58 dead and over 500 wounded because of blatant assumptions she made about people who enjoy country and western music. She has since apologized, and I’m glad for that, but I’m appalled that anyone could blithely dismiss such a horrible event because of how they perceived the victims. I have been stunned, more than once or twice, at how proud and stupid educated people (even in trusted positions) can be. And don’t forget what has been said about the incidence of sociopathic tendency or psychopathy as you get higher up. Hey, how about that pharmaceutical investor? What’s his name? Shkreli. As I recall, he’s headed to prison, Marleen. And he did more than she did… James. I would recommend more rigour in your thinking. (or how anyone could think they can get away with stuff. I didn’t say he shouldn’t go to prison. 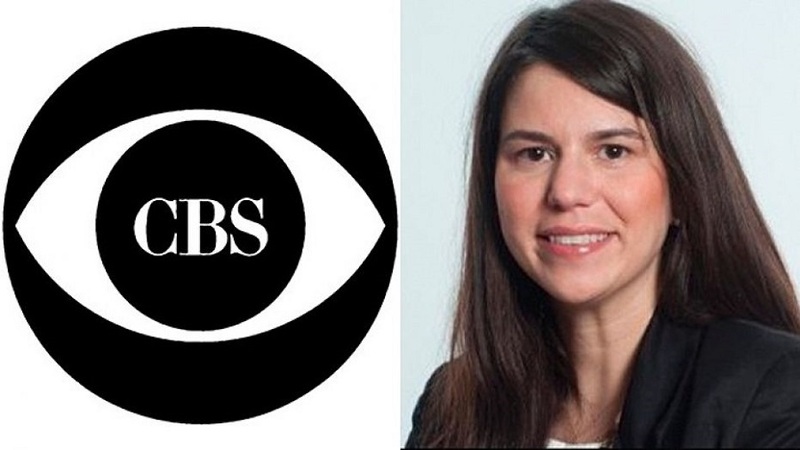 I believe he should while the worst Hayley is guilty of is bad judgment which cost her a VP position at CBS. I can only think of a couple of scenarios where someone would feel free to express such an opinion and both require that said-opinion be their truly held belief (subsequent apologies notwithstanding). The first is that she felt that anyone who had access to her comments would be wholly approving or at least neutral, including all of her friends, family, and her employer. That would require that either all of those groups have open conversations with her of a similar nature or they listen to such comments from her without registering dissent. The second is that she was “in her cups” so to speak, and with reduced inhibitions and good judgment, expressed her immediate emotional response. I can only hope the experience and what she’ll have to face in the near and far future will help her re-evaluate her attitudes in a more positive direction. I know people (and we can all see people in the public eye) who have been told hundreds of times that their expressed thoughts and that their behaviors and desired behaviors are inappropriate to say, to do, to wish for. They aren’t listening. They are too impressed with themselves or just daft. James. It seems that you are so into the “us vs. them” that it doesn’t matter if someone agrees with you (that something a woman said was wrong to say or think — even to the point that I made quite a strong statement above about sociopathic or psychopathic tendencies, etc. on the part of the person who got fired for what she said/typed). It won’t be agreement, apparently, until I relish making assumptions that it’s not this woman’s responsibility but the fault of everyone around her. It’s the left or the media or something. But that will not get anywhere. This categorizing thing is continued from the previous topic in which I was posting. In her (this immediate) case, neither of us was in her work environment or home environment or anything else. So, we don’t KNOW — really one way or the other. But it matters to know that someone being told isn’t the same as them listening or even necessarily having the capacity to understand. I’m hearing she apologized and maybe cried. This may be sincere, may not. She might just be crying that a consequence has been imposed. But who knows? What can be done is specific to cases that come up, and something significant was done. Beyond that, we can consider whether additional laws are needed — but I don’t see that here. I don’t recall saying that we have to agree and until you brought it up, I didn’t think we were particularly disagreeing either. Lol. Not sure what to say. I think the thing is that I’ve been agreeing with you on a basic subject, basic subjects (such as what this woman, Hayley, said being inappropriate and what another woman did/said being unauthorized but not so horrid). Yet you’ve couched the topics as if they aren’t about the primary subject — well, that they are but — are more about a larger grouping, an us versus them that you want to forward. You’ve gone on to say people should look around and see all this “us and them” stuff that is so rampant. * And more and more with time. ** And even the Bible says not to wrongly accuse. Anyway, I came back to this blog topic to share something (a life experience) that I recalled just a little bit ago today, a few minutes before coming here.. but then it seemed the thing to do to respond to your latest post herein; hope my response post is understandable. I can certainly be guilty of misunderstanding what people sometimes say Marleen, particularly in a “text-only” communications venue. I can also be guilty of expressing an “us vs. them” attitude which comes from a sense of being threatened. No, not physically, but my ideals and values, as if the world is spinning away from those things I consider good and right. Of course, people with different perspectives than mine might feel the same thing about me. I wrote a blog post today about how disagreement is actually a good thing, and I freely admitted that I at least sometimes feel uncomfortable when people disagree with me. Nevertheless, I continue to be a loud mouth in the blogosphere as well as Facebook and twitter. context, the word “celebrate” can really be found. I went to a local brewery a few months ago, and was visiting with the brewmaster/owner at the bar (a little bit). The guy I was with [I’ve used this term before in posting; it’s the person I’ve had my children with and to whom I used to be married] was being very outgoing and friendly (in his usual surface way), so the brewmaster was responding. At one point, the topic of their tap-handle style came up… and the local artist who had 3-D printed the ones behind the bar was said to be sitting out at a table. The guy I was with [sorry; if you have a recommendation for a term, I’ll consider it] wondered out loud if he could get one for himself. The brewmaster/owner/bartender quipped that he’d like to have a gun 3-D printed so he could shoot his ex-wife (completely out of the blue: this had not been a subject of conversation, although we did know he’d at least been in a relationship because he’d spoken of his daughter). I expressed shock on my face and in body language (with a tinge of humor as I didn’t believe he was actually serious, but I couldn’t just ignore it). Subsequently, “the guy” (who had hardly noticed what was said) decided to “introduce” me to the owner (this owner/bartender was totally new to both of us that day). The bartender was embarrassed. As we put out our hands to shake, he sincerely (I think) said to me of himself (with a sheepish, apologetic look), “Hi. I’m a bad person.” So, he was paying attention to cues in his environment. Various people are different. With some people, you might start with something understated because the issue should be obvious. If they don’t get it, you say something more direct (if you spend more time with them), probably not confrontational. They may still not be listening. You might get a yeah, sure, okay (brush off). You might get an argument (if you’re closer). Someone in a workplace could get multiple polite cues from many people. Still, I don’t think it’s common for someone to say something that blatant… as that man did (although, yes, men complain about their wives and ex-wives a lot — but that’s supposed to be fine or funny… or ordained). So, one might not get chances at correction before he goes and tweets the like. Obviously, that’s just an example. There are wives I imagine try and try to say something to their husbands. Some you can in fact see do this and see the husbands being impervious. Others try to do it privately. And some maybe do nothing or maybe even egg on the poor choices (with some other type of example against other people). It’s been my experience that people will tend to say things in online social media they’d never dream of saying out loud to someone’s face. Especially for people who are very used to social media (as opposed to those of us who grew up before the internet existed as it does today), the sense that what they post on Facebook is highly public (unless you set your privacy controls appropriately) never occurs to them. From what I could say of Hayley’s Facebook conversation, she was having a dialogue with at least two like-minded friends and in her mind, she may have felt like they were just friends talking to one another. Unfortunately for her, those comments were public and it cost her a six-figure a year job and perhaps her career. My understanding is that she’s even getting death threats, which is stupid of those threatening her, since they are reacting to her apparent lack of valuing human life. The brewmaster you mention on the other hand, is truly terrifying. If he is willing to make such a statement out loud and in public to people he doesn’t even know, I shudder to think of what acts he’s capable of. You know, after sharing the vignette of the beer man “out loud” with someone other than the guy I was with (who did hear what was said but wasn’t at all moved or concerned by it), even before reading your response I started thinking I should pay attention to who is involved if there is a domestic murder around here. It did sound, though, like an extension of the sentiments masked by common statements. It sure is stupid, and horrible, for people to threaten Hayley. And while she said she didn’t have sympathy, she didn’t say she would want to kill even one person… or that anyone should have done so. You’re probably right that she was “talking to friends” in public (and sometimes people say ridiculous things to friends because they haven’t thought through what’s really involved yet: best case*). I think she’s a lawyer. So that’s real dumb. “In his cups” first appeared (as far as we know) in printed form in the sense you mention in 1611, in, of all places, the then-newly-issued King James Version of the Bible (“And when they are in their cups, they forget their love both to friends and brethren”). There are actually two meanings to the phrase “in his cups” (which can be rendered, of course, just as well with “her,” “their,” or, in case one encounters a drunken robot, “its”). “In one’s cups” can mean, as you say, inebriated (i.e., drunk as a skunk), but it can also mean merely to be engaged in drinking alcoholic beverages, an endeavor which will not necessarily culminate in drooling on parking meters. This sense appears a bit earlier than the “stinking drunk” sense. Although I was given a KJV in second grade, that wouldn’t’ve been a memory verse. No, not for a second grader, Marleen. Oh. It really wouldn’t have been a memory verse.